The preparations for the new school year have been completed as area districts welcomed students back this week. District leaders from Grandview, Hickman Mills, Center and Kansas City are focusing on predetermined Board of Education priorities heading into 2017-18. Superintendents from each district presented those focus areas to members of the South Kansas City Alliance on Monday, August 16. New Hickman Mills Superintendent Dr. Yolanda Cargile said that the focus of the district continues to be acquiring full accreditation. Hickman Mills is a provisionally-accredited district and Cargile said that emphasis will be on the five priorities, including highly-qualified staff, attendance, being fiscally responsible, racial equity impact and increasing community and family engagement. “We believe focusing on those five items will help us to get closer to full accreditation,” said Cargile. She added that her personal goal as the new superintendent in Hickman Mills is to be visible in the community and establishing trust and relationships with the Board of Education and district staff. Hickman Mills is also implementing restorative practices in order to think differently about how to discipline students. Cargile said that not every offense should result in a suspension, and the district will be looking at new, innovative ways to determine punishment when rules are broken. She said that Hickman Mills has seen a decrease in out-of-school suspensions and formal hearings that have occurred over the last few years. Center School District Superintendent Dr. Sharon Nibbelink spoke about the Made Smart initiative and campaign to promote student academic achievement. The goal of Made Smart is to engage parents and the community in the learning process from birth through graduation to make students college and career ready. “The influence of parents on student success cannot be understated, and we want to support that,” said Nibbelink. The district doesn’t assume that parent guidance in education is natural, and has developed support materials to help families through every step of schooling. Nibbelink added that the four districts presenting share a lot of the same students, and therefore all have student success at the forefront of their goals. “We celebrate the successes of all of the schools around us because we all rise together,” said Nibbelink. Center’s strategic plan includes six goals focused on academic achievement. The district has hired a college and career coordinator to help with the focus on having students ready to enter the world after graduation. 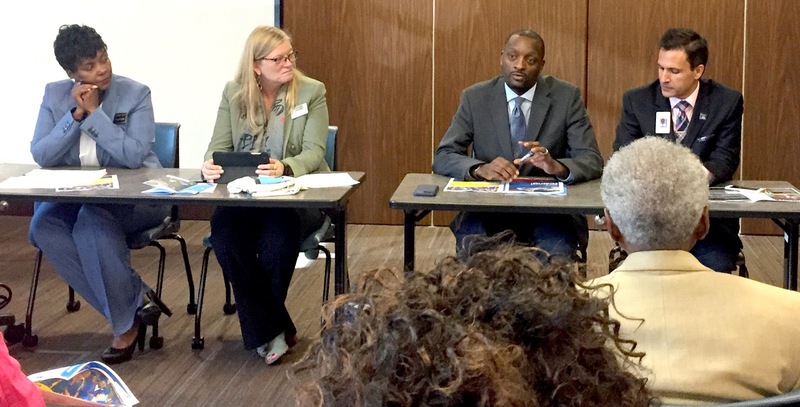 Kansas City Public Schools Superintendent Dr. Mark Bedell is beginning his second year at the helm as students headed back to the classrooms on Monday. He said the first year provided an opportunity for him to get a feel for the district and gain some contextual understanding as to why the district is where it is. He added that the mobility of families in his district is high due to the other 14 school districts surrounding KCPS, along with the 23 charter schools that reside in his boundaries. Preliminarily, Bedell said it looks like Kansas City Public Schools is trending in the right direction according to the district’s strategic plan. As part of that plan, the district engaged 170 secondary students to provide feedback and insight into KCPS’s blueprint for success. “We have to accelerate and close these gaps. We have to give these kids what they need because we don’t have a lot of time,” said Bedell. “My kids are down to 179 days remaining in the school year. We need to focus on what we are doing in the time that we have them and make sure that this plan addresses that." Grandview Superintendent Dr. Kenny Rodrequez said that the focus on his district is around centralizing their message. He said that everyone who works in the district is a teacher, and that building positive relationships with students is a priority. Each staff member in the Grandview School District has gone through cultural competency training, and is working on trauma-informed care training this school year. The focus is also on making sure students in the district are successful when they leave for work or college. Rodrequez said that the district’s ACT scores were not where they needed to be, so they are working on ways to implement test-taking strategies and trainings for students to be better prepared. “We want to make sure we can meet the needs of all of our kids,” said Rodrequez. All four district leaders presented highlights of their students and staff, and continue to work together to better the community as a whole.